There’s more to Kansas movie history than The Wizard of Oz, writes Daniel Loria in Boxoffice Magazine. A walk down Main Street brings back memories of days gone by, but there’s one building in particular that conjures a special connection to generations of people who’ve called Ottawa home. The Deco-style movie theater in the Pickerell Building on 211 S. Main Street has been a pillar of the community for over a century. Known today by its current name, the Plaza Cinema, the site has just been named the oldest purpose-built cinema in operation by Guinness World Records. “The look of the town, the architecture of the buildings, is all from the late 1800s or early 1900s,” says Madl. 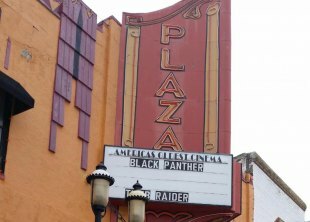 “You could put some old Ford cars and park them on Main Street and it would look like you were in a movie from another time.” The Plaza is a central aspect of the town’s timeless feel. Originally opened as a commercial cinema—The Bijou Theatre—in May 1907, the site went through its first rebranding in 1910 when it was renamed The Crystal Theatre. The programming in those early days consisted largely of imported shorts from France’s Lumière brothers. It wasn’t until 1935 that the movie theater began going by The Plaza. The theater has served as a commercial cinema throughout its entire 111-year (and counting) existence—a bit of history that would never have been uncovered without the chance involvement of Peach Madl and a small team of other key researchers, Loria wrote of the historic cinema. EDITOR'S NOTE: Boxoffice is a trade publication of the motion picture industry focusing on the exhibition phase (i.e. cinema ownership).